The AFG 13.0 AT Platform treadmill gets nice reviews and even earned a Best Buy distinction from Consumer Reports. If you can get it at the right price, it’s a good deal. The AFG 13.0 AT Platform treadmill console has a red LED brickyard and two 4-digit LEDs for workout feedback and data display. The 10 workout programs include speed intervals, incline intervals, pacer, weight loss, 5k course, 2 heart rate programs, and 2 custom. The display also includes a ProFILE performance tracking with Goal Setting. Wt / Dimensions: 242 lbs / 80" x 33" x 60"
UPDATE: The AFG 13.0 AT has been discontinued. You can take a look at all of the most popular models for sale here to compare specs and prices. The non-folding and no frills AFG 13.0 AT Platform treadmill offers a large 20" x 60" running surface with a 1.6mm thick belt and 2.5" rollers. The 2.5 continuous duty horsepower motor has a lifetime warranty, and the deck features a standard elastomers cushioning system. The machine also features the exclusive ProFILE™ performance tracking technology to record all of your workout stats for later review. 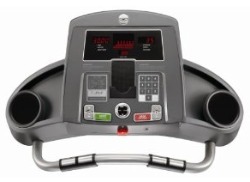 On the downside, there is no audio system on the console, which is something many treadmills at this price include as standard equipment, and the AFG 13.0 AT has a very basic monitor display that scrolls through time, incline, heart rate, distance, speed, and calories in the two windows. The console also contains an ever present (and unnecessary) current time and date display. 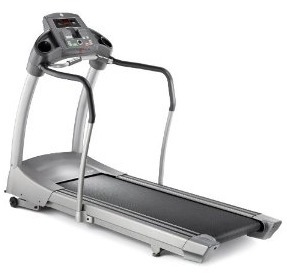 Other than the odd clock, this is a treadmill that focuses on workouts and not on console gimmicks. The AFG 13.0 AT feels solid on its 242-lb frame and has the power and cushioning to train for short 10k courses as well as provide daily workouts. It offers a larger user weight capacity at 350 pounds than many other machines in this price class, but overall, the 13.0 AT is still a step behind the leaders, the non-folding Sole S77, the folding Sole F83, and the Smooth 7.35. With those models, you get a larger motor, 350 to 400-lb user weight allowance, wireless chest strap, and better warranties. The AFG 13.0 AT Platform treadmill offers its best value is around $1599 to $1799 so if you find it at $1,999, wait until it goes on sale, or else go with go with a Sole or Smooth if you plan to pay $1800 or more for a treadmill.